Grain Farmers of Ontario has developed a biofuels ad campaign to run at select ONRoute locations along Ontario’s major highways. The goal is to educate consumers about the role grain farmers play in growing the crops used in biodiesel and ethanol. It is also a way to demonstrate our support of the biodiesel industry and to acknowledge the government for their commitment to biofuels. A Canadian Soybean Delegation completed a program to Tokyo and Osaka, Japan from January 18 – 25. It focused on further enhancing Canada’s relationship with industry associations, government officials and private corporations; promoting Canadian soybeans for food uses to potential international buyers; gathering market intelligence from end-users and government officials on soybean market trends in Japan; and gaining knowledge of new market opportunities that are available. The delegation included representatives from across the soybean value chain including producers, soybean exporters, and government officials. Representatives from Grain Farmers of Ontario were among the group as members of the Canadian Soybean Council. The program included two large industry seminars in both Tokyo and Osaka. In tota,l over 180 representatives across the soybean value chain in Japan attended – including researchers, whole sellers, and soy food manufacturers. This year’s seminars were titled “Canadian Soybeans: A Success Story”, and highlighted Canada’s ability and commitment to deliver a high quality product to our customers. The delegation also visited with several soy food manufacturing companies where they received a tour of their facilities and gained a better understanding of the changing dynamics in the soy food industry in Japan. 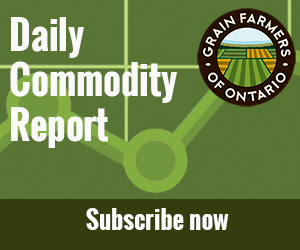 The biggest story of the New Year continues to be the precipitous drop in the Canadian dollar and its effect on the cash values of grains in Ontario. The loonie in early February was trading at .9056 US, but hit a low of .8978 US on January 31. During fall harvest of 2013, the loonie was trading in the 97cent range. The lower dollar has translated into positive cash basis values for soybeans and better cash values for corn and wheat.